Spirit Driven Events II is the long awaited sequel to Spirit Driven Events - Fascinating and Enlightening True Stories. 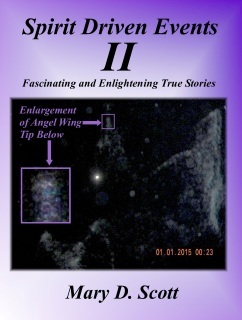 This book contains new Spirit Driven Events as well as updates to some of the Events in the first book. Everyone possesses spiritual abilities. One only needs to learn how to recognize them for the good they were meant to be used. My spirit allies and I hope to enlighten you to become aware of your spiritual abilities by learning from my spiritual journey. Our hope is for you to be able to relate to some of these Events in your own life by having your own AHA moments and therefore realizing your spiritual abilities. While this book has been long awaited (and I have been pushed by many to do so, including my spirit allies), I can honestly say I would not have written it if I had not captured the huge Angel with the face of Jesus and the important message which comes with it. The picture had such an affect on me and it gave me great hope --- on a global level --- I just had to name it “New Year 2015 – Angel of Abundance.” This year is going to be very good and enlightening for many, and not so good for others. I hope you the reader will WAKE UP and follow your inner-God, as I do on a daily basis. I look forward to the second coming of Jesus and the Pleiadians --- for this world is a mess and we need all the help we can get. 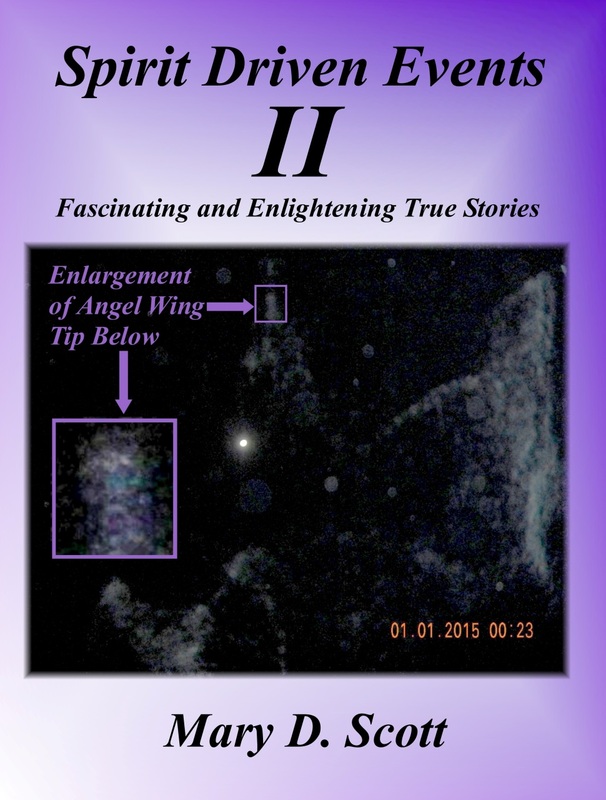 "Spirit Driven Events II- Fascinating and Enlightening True Stories". The book is about 214 pages which includes 80 pictures where spirits were captured... including the spirit of Elvis and an Angel with the Face of Jesus! Such challenging memoirs with details and very interesting scenarios projected in positive-caring thoughts. Many stories can stand alone as they bring the characters of real life to the forefront as you read REAL-LIFE spiritual journeys. Nicely done Mary D. Scott!!! Well worth the read!! This latest book by Mary D. Scott, “Spirit Driven Events-II” is by far her finest achievement thus far. I found as I was reading it was difficult to put down this book. The Events are true and delves into a world previously unknown to me. I learned many facts about healing, orbs, unknown entities and spirits (good and evil), Chakras, rocks, etc. The book opened up a whole new world for me. If you are interested in the Metaphysical / Spiritual world, I recommend this book. Spirit Driven Events II gives great insight on some amazing new spirit driven event stories and how it has helped others, and some useful information and cool photos. Have you ever wondered what it would be like to be a spiritual healer? Well, Spirit Driven Events II is a perfect book for an insight on a healer's life, with all the up and downs these true stories will make you a believer. I know I am as I have had a spirit driven event myself. I enjoyed this second book very much.